Deepings Swimming Club enjoyed a highly successful East Midlands Regional Championships with a squad of 13 swimmers reaching 26 age-group finals and winning eight medals. All the medals came in butterfly events, with one gold, four silver and three bronze. 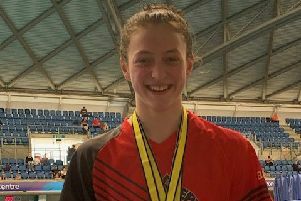 Isabel Spinley, who was recently selected to represent Great Britain at this summer’s European Junior Championships, was once again in outstanding form, winning gold in the girls 17/Over 100m butterfly and silver in the 200m. She also made the 400m individual medley final, finishing just outside the medals in fifth, and narrowly missed the 100m freestyle final despite setting a new club record. Deepings had three swimmers in the 200m 15yrs final where Ben Beedall claimed silver, edging out team-mate Tom Adams, who finished with bronze, while Kallum Penman was close behind in seventh. Adams swam in nine events and made the final in seven. In addition to his 200m butterfly bronze, he also won silver in the 50m butterfly with a new county record and took a second bronze in the 100m butterfly. Bethany Eagle-Brown (14) was the club’s youngest medallist, winning silver in the final of the 100m butterfly. She also made the final of the 50m fly and 50m freestyle and set a new club record in the latter. Emily McCann highlighted the club’s supremacy in the butterfly by winning bronze in the 50m event. Holly Leggott (14) broke her club 50m freestyle record twice in finishing seventh in the final and Chloe Jones made the finals of the 200m, 400m and 800m freestyle, as well as the 200m backstroke. Her best performance came in the 800m freestyle, where she swam strongly to finish fourth. Louis Metselaar reached three finals and Jake Jungmann two but both just missed out on medals.